The tag lattices is a problem since a long time. Over the years there were varied discussions about this, but no clear resolution emerged, though some things were done to better the situation. This is an attempt at a fresh start of the discussion to find a long-term solution. Questions with this tag tend to be about either partially ordered sets, or discrete subgroups of Lie groups, or finite rank free abelian groups equipped with a quadratic form. The theory of lattices in the sense of order theory. For the number-theoretic notion, use the tag "lattices" instead. There is also tag euclidean-lattices, which is more specialized. The main problem as I see is that the tag lattices is half-way deprecated while there is no clear alternative except for the order theory questions (and those about euclidean lattices). Personally, I am not even quite clear about all the exact notions users might like to tag with some variant of "lattices," and in earlier discussions sometimes users were talking sideways for reasons like this. For example while I can see what is roughly meant with "Lattices as they are used in number theory." it is not exactly clear either. Not each answer needs to, perhaps even should not, try to hash out a complete solution (we tried this several times already), but rather I envision that somebody writes down so to say "their kind of lattices", that is, what "lattice" should encompass in one given context. And, if this notion should get a tag, how this could be named distinctively. 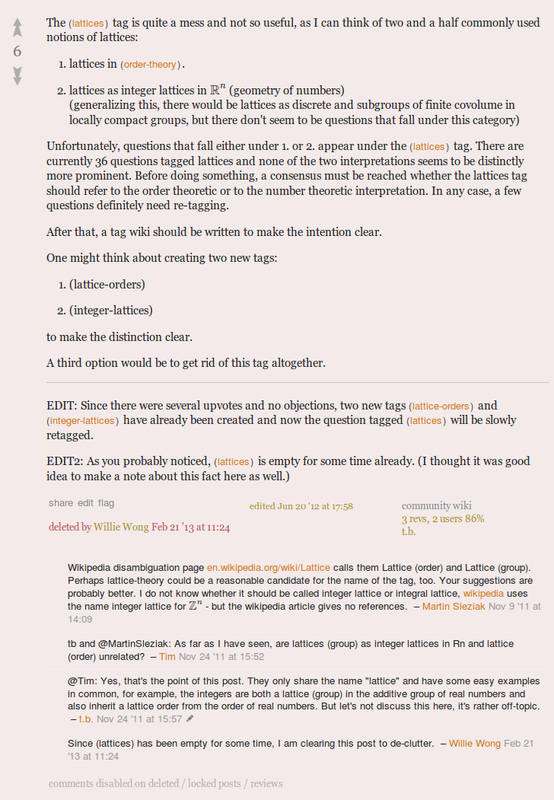 Based on such a list we could then create the new tags, definitely deprecate lattices and over time distribute the legacy questions as needed over the new tags. Describe for one given context what "lattice" should encompass and propose a tag-name for this.